In yet another big reveal involving slaughterhouse sins, Southern Quality Meats of Mississippi is being investigated by the USDA after a video posted on PETA's (People for Ethical Treatment of Animals) website shows graphic footage of animal suffering violations. The media feasted on the topic. 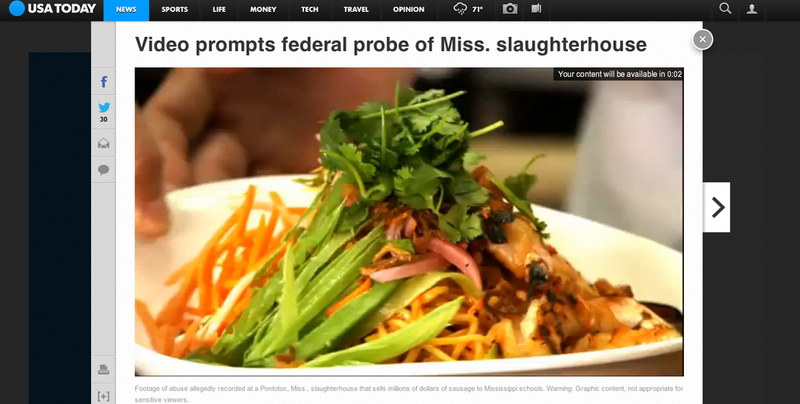 In one interesting example, USA Today posted an article that showcased the footage with the headline, “Video prompts federal probe of Miss. Slaughterhouse.” To access the shocking content, USA Today required people to watch a video advertisement first (a pre-roll video ad). In this case, the video ad happened to be sponsored by PF Chang's China Bistro, the Asian-style restaurant chain that features dishes such as Sweet & Sour Pork. The coincidental conjoining of these two pieces of media reveals connections and economic circumstances that beg the question – who is the pig in this scenario? The first part of this tale involves the behind-the-scenes workings of media content and ads. The USA Today story is intentionally crafted to serve as "link bait," which means it is designed to entice visitors looking for particular content to view an ad that earns the website revenue. The ads are targeted by geography, past web browsing activity and demographics like age and gender that are typically not known by Internet users. This type of media play is common on commercial websites that target viewers using sophisticated digital tools. Once the ad finishes (and USA Today earns its revenue), the video containing the desired content commences automatically. The second part of this pork story involves the slaughterhouse. What makes this routine web publication so interesting is that the USA Today link bait coincidentally connects PF Chang's beautifully-photographed high concept food product with a harrowing video that reveals the ugly underbelly of the food industry -- and confronts us with the sad reality that this is the way many of our food products end up on our plates -- at restaurants just like PF Chang. Just as the publishers of content wish to display ads using tools that remain hidden, the food industry wants the circumstances of production to remain hidden from the final high-margin food products. Any food product (for example, PF Chang's Sweet & Sour Pork) and its original source (e.g., the pig) are in fact connected by a web of suppliers, preparers, handlers, investors, and others who are typically invisible to the consumer -- but each of whom has an economic stake in the process. In a crazy twist of fate, in this case the graphic images of a man domineering over a suffering pig while wielding an electrical wand provides the link bait that targets new customers of PF Chang; thus, the two ends of the food chain are connected for a brief – extremely unappetizing – moment. If the video of the alleged violations proves truthful, then a reasonable person could conclude that Southern Quality Meats regards pigs not as living creatures worthy of humane handling practices, but merely a source of profit margin -- and an outlet for sadistic fun and games. The economics of pig production and pork marketing are easy to understand in this case. HIG Capital, the private equity firm that bought Southern Quality Meats in 2010, is likely targeting at 12% IRR (internal rate of return) on its investment in the pork slaughterhouse. USA Today is likely expecting a 5-10% CTR (click through rate) for the link bait article on a cost per click (CPC) rate of something like $1.0-$3.0. Similarly, PF Chang's Asian Bistro (stock symbol: PCFB) is seeking to maximize long term value (LTV) relative to new customer acquisition costs (CAC), while targeting an overall 35-40% food product margin. There are definitely a lot of pigs at the trough in this equation! In order for PF Chang to sell you a Sweet & Sour Pork entree (710 calories, 25g fat, 6g saturated fat, 1440mg sodium) with a sprig of cilantro on top, the company needs to appeal to your emotions with beautiful images of food and focus group-tested product names and labels that are far removed from the often messy processes that led to the food product's creation -- and also to the potentially devastating consequences that consuming the high fat, high calorie concoctions may have on your health. Internet users and pork consumers alike face a kind of reality shaped by forces and technologies that obscure economic relationships and consequences. While using link bait to convert content to ad revenue seems relatively innocuous, the inhumane treatment of animals to produce high fat, high calorie food products has an altogether different consequence in terms of your health. The process that turns food into food products obscures the food's source and its chain of provenance - similarly, marketing food products on the basis of such things as visual sensation and tang & zest often obscures the food product's metabolic and nutritional value. The unfortunate reality is, consumers are not likely to demand more humane handling of animal food sources -- or to question the health consequences of the food products they consume -- when the visual images of final products are highly stylized - or can I say, the pig has a lot of lipstick on it. Conspiracies theories aside, consider the bigger picture in the industry. The pork space is hot! The industry is undergoing major changes that will impact production and consumption globally. In fact, the largest pork producer in the USA, Smithfield Foods, was recently purchased for $4.7 billion by a Chinese company in a controversial transaction - some even suggest the purchase touches on matters of national security. On the demand side, consumers are eating ever more restaurant-prepared dishes; restaurant sales hit an all-time high in April 2013. Industry consolidation ramps up, private companies pursue profit motives and consumers eat out at restaurants at a higher frequency than ever before. Perhaps it's too easy to label all the food suppliers "pigs" when the consumers of food products are gorging at the trough too. Who's the pig in peak pork? One thing is for sure, as the image below testifies, we as consumers are paying for the blind consumption of food products at the expense of real food in more ways than one. Source: Wikipedia article "Metabolic Syndrome"